Dogtrot is the colloquial name for a house with two sides of rooms linked by a covered open passageway. The dogtrot was the second-most-common house type on the southern frontier; only the even simpler one-room cabin was more prevalent. The geographical and cultural origins of the house are murky, but evidence suggests that it did not develop in a solely southern context, although the form has deep and long-lasting connections to southern settlements. Settlers in other parts of the United States quickly replaced dogtrot houses with more refined buildings, often transforming former domestic structures into barns or other support buildings. In contrast, southern settlers continued to build in this original, unpolished form well into the nineteenth century, especially in Alabama and Mississippi. Dogtrot houses featured logs laid horizontally on top of one another, fitted together at the corners with notched joints. The weight of the log above held each piece in place, and gravity secured the joints. Gaps between the logs were filled with clay or clay mixtures. Sometimes cracks at the meeting point between wall and joists served as windows, which were generally unglazed. Room sizes depended on the size of the timber, which often provided about twenty feet of usable length. The flexibility of the log house appealed to new settlers because the structures were easy to expand. In many cases, owners built single-room cabins and later enlarged them as they became more established. Simply adding another pen and connecting it to the original by an open air passage changed the tone and meaning of the house, making a more permanent statement on the land and addressing the spatial needs of a growing family. Based on contemporary reports, enclosed rooms on either side of the central hall were used for sleeping, while the open passageway was the primary living space, used for dining, socializing, and sheltering both people and animals. The tunnel created by the open passage funneled the breeze through the space, creating what was probably the most comfortable area in the house. 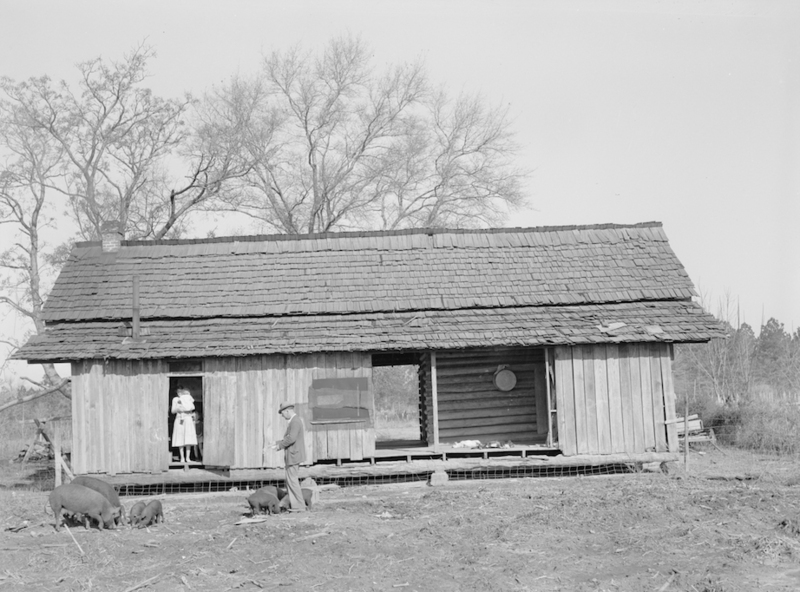 The most rudimentary dogtrot houses worked well in a region with abundant timber resources and few laborers to produce finished materials from those supplies. In 1818 a settler in Northeast Mississippi reported that he built a single-room log house in five days with the help of his brothers and a neighbor. A dogtrot house would not have taken much more time or effort to assemble. Not all dogtrot houses featured rough materials and quick construction, nor were they built only by newly arrived settlers. Many southern farmers continued to use the dogtrot form even as their farms became established and prosperous because the building form suited the hot, humid climate. Some planters built in the dogtrot form but used more refined timber framing instead of rough logs. Some planters continued to build with rough logs while filling their homes with sophisticated furniture, rich carpets, plate, and books. In a few cases, more sophisticated dogtrot houses might feature folding doors at either end of the passageway to allow the space to be fully enclosed. Many southern farmers chose to invest in land and labor rather than spending money on big houses. Nineteenth-century agriculture encouraged such practices, since farmers expected to move on after their land had been depleted by overcultivation.